Billions of years ago, our baby planet was smashed by another planetary body, turning it into a burning ball of molten rock. 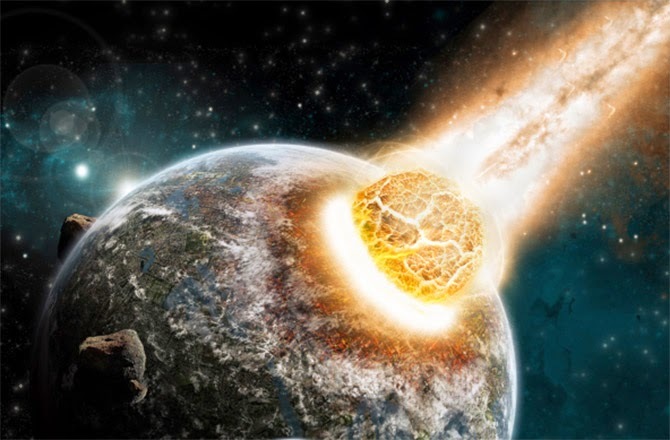 But according isotopes recovered from deep inside the Earth’s mantle, some of the pre-impact material persists to this day, possibly proving that some of our planet survived the cosmic collision intact. During that epoch of our solar system’s evolution, planetary collisions were commonplace and it is thought that a hypothetical Mars-sized body, nicknamed “Theia,” hit Earth in a cataclysmic collision some 4.5 billion years ago. The energies released during impact would have totally transformed our planet, obliterating its surface and melting its rocky mantle. But the extent of this planetary transformation isn’t well understood. Was Earth completed melted? Or have some pockets of material of a primordial Earth persisted to modern day, proving that not all terrestrial material was affected by the Earth-Theia encounter? Mukhopadhyay is presenting his team’s work at the Goldschmidt geochemistry conference in Sacramento, Calif., this week. The research focuses on the comparison of noble gas isotopes in the deep mantle compared with the shallow mantle. The Earth’s mantle is a silicate rocky shell that extends from the crust to as deep as 1,800 miles (2,900 kilometers) to the Earth’s molten outer core. The mantle is differentiated into different mineral layers that provide information about our planet’s ancient geochemical past. The researchers analyzed ratios of isotopes of Helium (3He) and Neon (22Ne) and found that the ratio was significantly higher in the shallow mantle than it was in the deep mantle. “This implies that the last giant impact did not completely mix the mantle and there was not a whole mantle magma ocean,” said Mukhopadhyay in a press release. In other research publishedin the journal Science last week, isotopic analysis of elements inside moon rock (rock recovered by the Apollo missions from the lunar surface and moon meteorites recovered on Earth) revealed the chemical signature for Theia and geologists have been able to deduce that around 50 percent of the moon is likely composed of material originating from the interplanetary impactor. Deep down in the Earth’s mantle, material from a pre-impact world appears to be lurking, providing us with an intriguing geological time capsule of a very alien ‘virgin’ Earth.